Create a romantic Valentine's Day at home with these recipes from DINE inns. As we approach the month of love, we thought it might be a great idea to offer some ideas for Distinctive Inns of New England (DINE) recipes from the heart. After all, the stomach is simply a by-pass when it comes to matters of the heart. We’ve written so many blogs about great recipes from the kitchens of DINE inns, that we thought we’d simply compile a collection of links to heart-felt recipes for this Valentine’s Day. With an acronym like DINE, we must be experts when it comes to food, right? Last week we talked about romantic experiences, but today we’ll focus on romantic dinners, desserts and breakfast ideas for Valentine’s Day. In our blog about how to create the perfect romantic dinner for Valentine’s Day, we combined recipes for a Beet and Spinach salad from the Deerfield Inn with Cocoa, Cinnamon & All-Spice Crusted Beef Tenderloin from Rabbit Hill Inn , popovers from Captain Jefferds Inn and a fabulously rich Chocolate Marbled Mousse from the Grafton Inn. If this special dinner isn’t the way to your Valentine’s heart, nothing else is! Yet, not everyone loves chocolate mousse for dessert, so in our blog about recipes that take the cake for romantic desserts, we offered up a number of luscious and easy dessert ideas. How about Gateways Inn & Restaurants Easy Black Forest Cake or Chesterfield Inn’s Chocolate Tissimo Cake or Mocha Crunch Ice Cream Cake? Not a chocolate or mocha lover? Rabbit Hill Inn offers a recipe for Easy Pumpkin Cake and the Deerfield Inn’s Red Velvet heart-shaped whoopie pie recipe is also found in this article. If anyone knows how to create a romantic and hearty breakfast it’s DINE innkeepers. Experts in both romance and breakfast, they shared some great recipes for how to make breakfast the most romantic meal of the day. 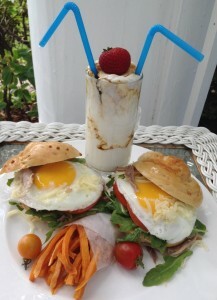 It starts with a vintage-breakfast for two from Rabbit Hill Inn with Retro Egg Sandwich served with Sweet Potato Breakfast Fries and Coffee Ripple Yogurt Smoothie. This combination was so good, it caught the attention of Rachel Ray! If your sweetie is a fan of sweet breakfast recipes, you’ll find the Peach Melba French Toast with Romanov Sauce recipe from Captain Jefferds Inn a great idea for your Valentine’s Day breakfast. It is widely known that ginger has been used for centuries as a highly effective aid to digestion. But did you know that ginger is also a popular aphrodisiac used by cultures around the world? In India, when mixed with eggs and honey, ginger is a traditional treatment for impotence. Asians believe it will improve circulation to hands, feet and well…all extremities. Legends tell that in far reaches of the world, when ginger is applied topically it can enliven men’s fading desires. For all these reasons, and because it’s hot-hot-hot and spicy, we’ve included a link here to a blog posting about For the Love of Ginger. Even if your Valentine doesn’t need Ginger for any of the reasons above, you can’t go wrong with this recipe for Caramel Ginger Banana Wrap With Espresso Cream from Rabbit Hill Inn. 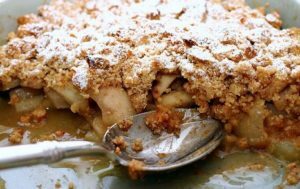 The Gingered Pear Crisp recipe from Captain’s House Inn will delight for either breakfast or dinner and the Spiced Pumpkin Crème Brulee from Chesterfield Inn offers just a touch of ginger to give it that heat. And in keeping with our theme for romance and a little naughtiness, how about some great ideas for creating your own Peep Show! Those brightly colored marshmallow peeps are not just on the shelves for Easter, they can be used in your Valentine’s Day treats too, for things like PEEPermint and Irish coffee or Peep S’mores using peeps instead of marshmallows. All or just one of these ideas will make a great addition to your Valentine’s Day. However, nothing beats the way to your sweetheart’s heart like a romantic getaway to one of the DINE inns. Follow any of these links to your favorite Distinctive Inns of New England member and start planning now. Remember, Valentine’s Day and the two weekends on either side of it are popular times for booking at DINE inns. This entry was posted in Captain Jefferds Inn, Captain's House Inn, Chesterfield Inn, Deerfield Inn, Rabbit Hill Inn, Recipe, Romance, Romantic Getaway, Uncategorized, Valentines day getaway and tagged breakfast recipes, dessert recipes, fun recipes for Valentine's Day, New England inn romantic getaways, recipes, romance at New England inns, Romantic Getaways, romantic recipe for Valentine's Day, romantic recipes, romantic recipes from New England B&Bs by DINE Blogger. Bookmark the permalink.